OUR PRODUCTS | CALL 512-868-0047 TO PLACE YOUR ORDER TODAY! We make every Tail Waggins cookie to be a wholesome, all-natural, and preservative free treat for your beloved pet. These fun, tasty treats are handmade with premium human-grade ingredients. Each cookie is double baked for the ultimate crunchy texture. Goodies for the holidays and special occasions, including cookies made just for Halloween, Thanksgiving and Christmas. Celebrate your best friend’s birthday with one of our birthday treats. Our special goodies are made the same as the rest of our products. All-Natural ingredients made with love for your pet. Our fancy specialty cookies contain all the same great healthy ingredients as our ‘everyday’ treats. These fun and festive treats make great gift ideas, and are the perfect way to show your little one how much you care. Fun treats with a European flair. Just for your dog, we slow bake these treats twice for superb flavor and crunch. 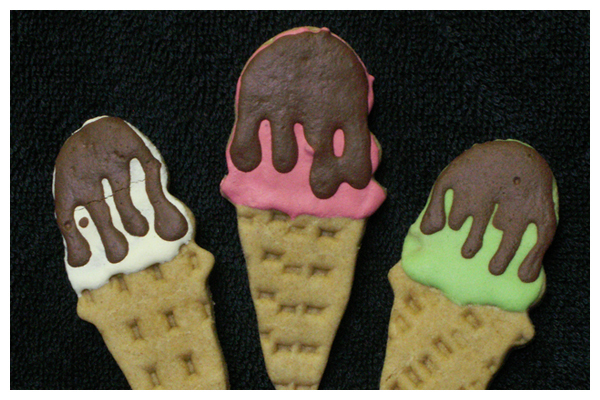 Each treat is hand made and glazed with pure dairy toppings, colored with natural vegetable and fruit extracts. There’s nothing plain about these old stand-bys. Our P’NutButtery Bones and PettiBones (Vanilla) are made with all-natural, premium human-grade ingredients. Our Veggie Bites are loaded with top-shelf peas and carrots. With superior flavor and texture, there is no wonder these treats never fail to please. A large portion of our treats are perfect for pooches with special needs. No wheat? no egg? no problem. Visit our specials needs page to find treats for your special dog. Great gift ideas, our samplers come attractively packaged, perfect for special occasions. Christmas, Halloween, a special birthday, or a special someone under the weather? Send a sampler, and don’t forget to choose a gift card, or create your own. A variety of doggie cakes, with one that is just right for your special occasion. We even have a wheat-free cake! Make your next celebration uniquely special.